The right lighting design will transform the way you live and work in your kitchen. At Wolfers, we specialize in installing light fixtures in just the right places, providing the perfect balance of style and functionality needed to design a kitchen lighting scheme that works for you. 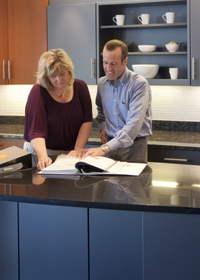 As you work with our lighting consultants in our kitchen lighting lab, you will see firsthand how different light sources, including LED, incandescent, halogen, and fluorescent lighting, can impact your countertops. You will experience the dramatic effects of pendant lighting and learn how to combine track lighting, recessed lighting, and ceiling lights with dimming controls, arranged in preset options.Whatever lighting selections you envision for your dream kitchen, our kitchen lighting design consultants will help you find what you need. Wolfers will help you transform your bathroom from basic to beautiful with a unique and customized bathroom lighting scheme. Our lighting experts will offer you a wide range of choices, like recessed lighting, wall sconces, task lighting, and ceiling lights for your bathroom lighting design. Our bathroom lighting labs give you the power to experiment with brightness, sources, and lighting placement to achieve effects desired for creating a relaxing yet functional atmosphere in your bathroom. In a real-life setting, you are able to explore how different types of lighting can work in the bathroom and discover which solutions are best for you.